When we launched Private Packagist in December of 2016, it included the minimum feature set we deemed necessary to make it a valuable product to our first customers. But due to Composer’s broad support for version control systems, code hosting platforms and authentication protocols, this meant Private Packagist was immediately compatible with all the same systems and platforms, namely Git, Mercurial or Subversion using SSH access, HTTP Basic Auth over SSL, or their native protocols. To simplify the initial setup and maintenance of a Private Packagist account, we launched with optional synchronization for GitHub organizations. This integration keeps teams, their members, and access permissions in syncwith a matching GitHub organization. So you only need to manage users and permissions in a single place. 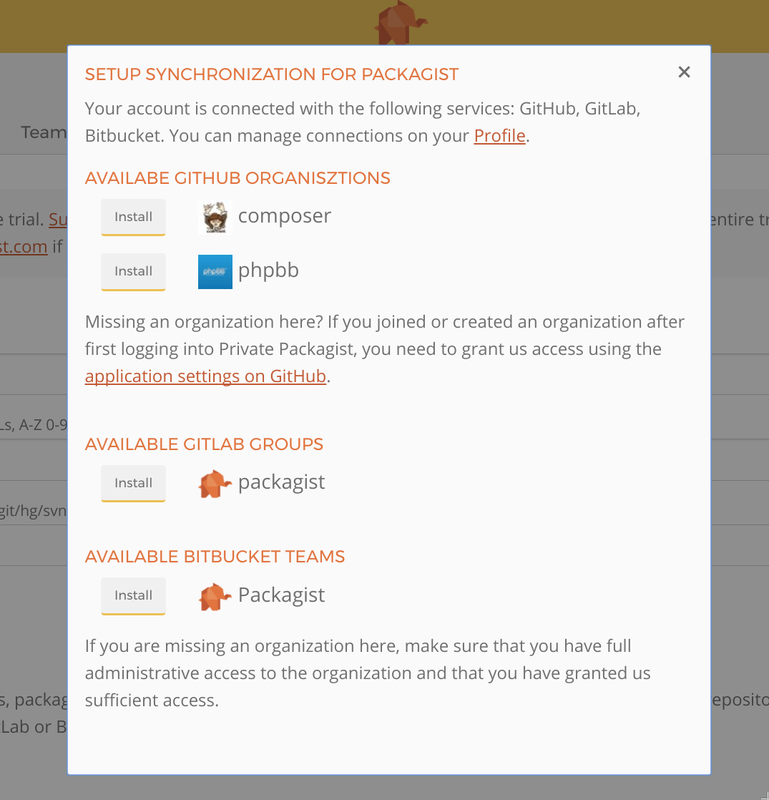 Synchronization is now available for Bitbucket and GitLab users! Please give it a try and send us your feedback, we’d love to better understand if it helps or how it could be made even more useful for you specifically. As of last week, you can use your Bitbucket.org or GitLab.com user accountsto log into Private Packagist at packagist.com. If you already have an account you can connect these services to your existing account on your profile page. You can then either create a new organization directly synchronized from a Bitbucket Team or a GitLab Group, or you can enable synchronization for an existing Organization in Settings. Apart from synchronizing teams, users, and permissions, setting up the integration will simplify the addition of new packages to your Composer repository. When you create a new repository on Bitbucket or GitLab it will be added as a Composer package automatically if it contains a composer.json file. If you’d like to add existing repositories as packages, you can do so with the click of a button on the Packages tab in your organization. Update web hooks notifying Packagist of new code pushes will be installed in the background, and credentials to access the package will be configured automatically. We will be attending a number of conferences over the next months and hope to meet you there! If you’re already using Private Packagist we would love to hear your feedback! If you aren’t using Private Packagist yet, stop by to get a live demo and to get all your questions answered in person!